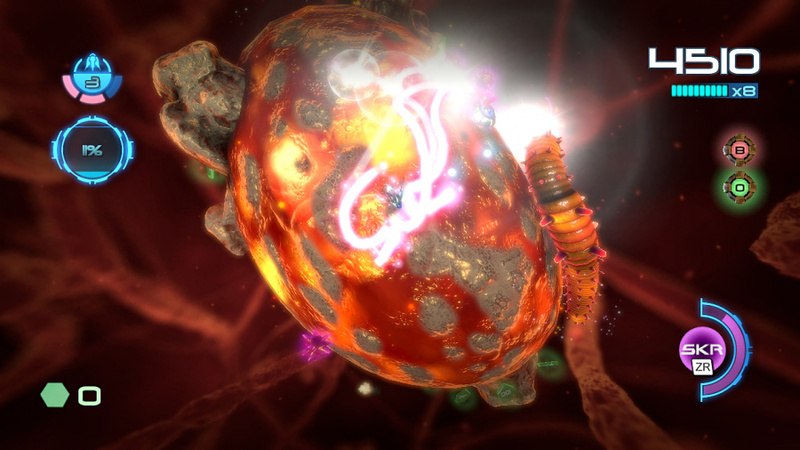 Much like the its 3DS predecessor, Nano Assault Neo is an arcade-style shoot 'em up that’s all about piloting a microscopic spacecraft and blasting molecular baddies. There isn’t actually a plot present in this game, so there’s no need to worry about being bogged down by unnecessary story. What we have instead is a fast-paced, and often punishing, twin-stick shooter that will keep you on your toes and begging for mercy. 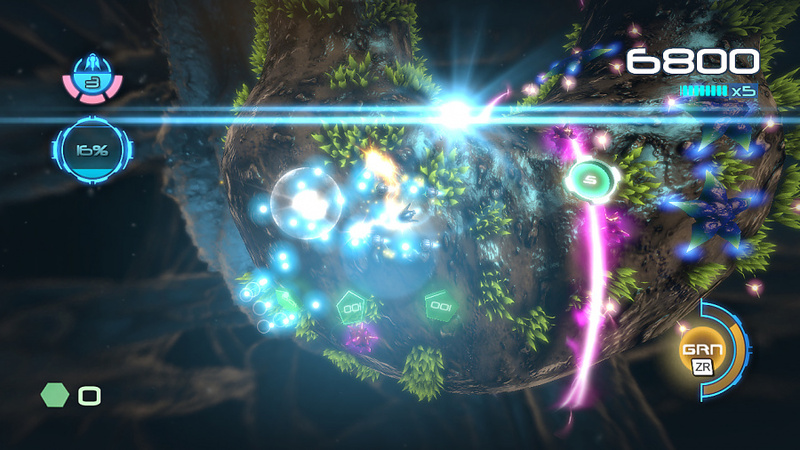 Nano Assault Neo is made up of four different campaigns, or cell “clusters”, which contain three levels and a boss battle in each. There's also an unlockable bonus level that plays more like an endless tunnel game, but this is not at all dependent on the campaign and only exists to increase your score. Completing a cluster will mean unlocking the next of the four, and polishing off all four clusters will unlock Survivor mode. As the title implies, this is an endless run of all 12 campaign levels in random order, which must be completed using only one life. While the campaigns do have a tendency to be a bit on the difficult side, trying to complete Survivor mode will have you weeping like a child. If you’re having trouble completing a particular campaign, there is the option to play in two player cooperative mode. To avoid confusion and alleviate players from what could potentially be an overwhelming split-screen experience, the second player uses a Wii Remote and Nunchuck, Wii Classic Controller or Wii U Pro Controller to control their ship on the television screen while player one sticks entirely to the Wii U Gamepad. While the GamePad obviously does not support the full HD of a modern television, everything still looks crisp and unhindered by the smaller stature. The biggest complaint here is that the campaign is a little on the short side, though there is also an Arcade mode that allows you to replay any level of your choice. All scores from Arcade mode automatically get uploaded to online leaderboards, so all of you high-score seekers out there will be able to constantly fight for the top spot. Arcade mode, while simple in nature, adds plenty of replayability to any of the levels that you may have already finished in the campaign. While there is not a true upgrade system for your ship or weapons, there is an in-game shop where you can purchase weapons using credits that are earned based on your score and pickups in each level. Here you can purchase satellites, which are additional guns that circle around your ship, and you can choose from a variety of secondary weapons as well. The available secondary weapons vary from enemy-seeking lasers to close-range melee-esque attacks, so choosing the right weapon for you can potentially alter the way that you play. True weapon upgrades and a variety in primary guns would have been welcomed, but keeping to the game’s tendency towards simplicity, these features are left behind. One of the beautiful things about Nano Assault Neo is how simple it is to control, and how naturally the controls are optimized to the GamePad. Your ship is controlled using both analog sticks – the left stick is used for manoeuvring your ship, while the right dictates where you’ll be shooting. Pressing the right shoulder button triggers alternative weapons, assuming you have one equipped, while checking out the level map and adjusting your satellite arrangement is done on the GamePad’s touchscreen. As mentioned earlier for the co-op play, if you choose to do so this game can also be played entirely on the GamePad screen, but the controls remain unchanged. Aesthetically speaking this game is, in a word, gorgeous. The image quality and attention to detail in both level and character design is astounding. The levels, while similar in design and scope, are all easily differentiated by their layouts, colour schemes, and hordes or interesting enemies. Despite the lack of true variety in design from level to level, traversing from one cell to another never feels tedious, and the feeling of being in a completely new and unexplored environment is ever-present. 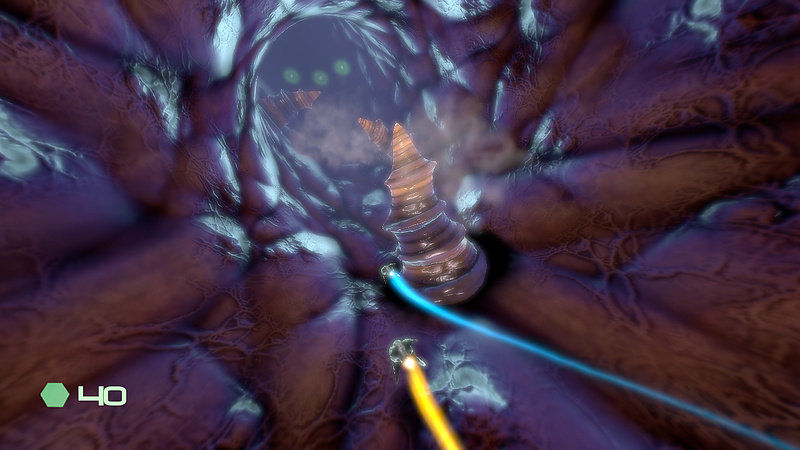 Matching the pace of gameplay and the beauty of the environments is a booming electronic soundtrack. Each song is made up of a deep techno beat, that borders on industrial, and adds to the intensity of being assaulted by an onslaught of hundreds of micro-organisms bent on your demise. There is no true achievement system on Wii U, but Nano Assault Neo has its own missions built in that fulfil this missing feature. Completing achievements won’t unlock any additional content, but they will show up next to your scores on the leaderboards, ensuring that bragging will quickly follow. Nano Assault Neo is a great game that is a little light on content, but it still packs enough of a punch to keep gamers occupied. There isn’t a plot to be seen, but the focus here is definitely more on arcade-style high score seeking action, all while looking and sounding great. With highly addictive twin-stick shmup gameplay and difficulty levels that will have you trying over and over again, you’d be remiss to pass up on what could easily become an arcade classic. Is it very hard? I'm easily frustrated and disliked the original Nano Assault because I couldn't beat one level. not easy or hard really did you use dual analog sticks while playing the 3ds version? Now, go do Trine 2! Reminds me of a 3D gradius! BTW, does this use UK dates for scores like in AOB? If so, I won't get, as IMO it looks quite terrible to mix up December 1st with Jan 1st. I like proper dates in my score games. @arrmixer I don't have the Nintendo 3DS version. I have the Nintendo DS cart. How is it possible to mix up January 1st with December 1st? December 1st and January 1st are impossible to mix up, no matter where you live. Also, Shin'en is a German developer. Therefore they use the European dating system. There are countless games released in Europe with a broken dating system, so stop acting like a martyr. I agree with the review, but I think there is one more negative. As far as I can tell, you can only check the leader boards once you get a good enough score, there's really no way to keep up with people's improving scores other than miiverse. Also, this game is really tough at first but you get better at it really quickly. I play it in bed a lot. Be sure to try the multiplayer as well, it's really fun. Thanks for the review! This just reinforces my intention to buy. Looks like a great game to show off the gamepad and based on videos is one of the prettiest Wii U games at launch. It's looking like the Wii U will be worth it for download games only atm. Great launch line up for both formats. At least they got that right this time around! This looks absolutely brilliant, and that two-player co-op sounds like a blast! Great review, mate! Hi, you can check out the leaderboards any time from the main menu. In the main menu you can select a game mode and level and press X to show the online rankings for this level or mode. On the bottom of the screen you can see the current possible actions for each menu entry. Yes, two digits are covered by the country flags. There is already a small patch submitted to Nintendo for that issue. It should be online in a few days. Sorry for the problem. Hi, i think we did it right this time. @Manfred Thanks for posting here! Also, any way you guys could patch in online multiplayer? Or DLC? Or make a sequel? I want more Nano Assault. Also, when Nano Assault EX coming out? 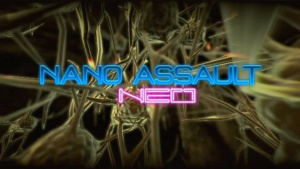 Nano Assault EX should be available on the eShop in a few weeks, hopefully still in 2012. @Manfred Its great to see a developer interact with its fanbase! Love your games, can't wait to check out Nano Assault for Wii U. @Manfred Good deal. Any word on a price? @Manfred, thanks for the link. I was worried that in Nano Assault Neo the ship looked a bit slow but watching the youtube link allayed those fears. Can't wait to get Nano Assault EX on the Australian eShop, really hope it comes out soon! @WiiLovePeace The ship's about as fast as enemy projectiles. I think it's a good speed. I liked the original on 3DS, but I haven't really gone back to it. I would have preferred something more like Nano Stray. I'm just not digging the Mario galaxy like shoot'em up thing going on here. It is a good game though. This will probably be my first download on the Wii U. It looks great. @Lan good to hear Does the lack of a story hinder your enjoyment of the game? I think its a bit of a turn off personally. @WiiLovePeace Not at all. I play mostly for gameplay though. Stories don't mean much to me. And the gameplay is really great. Feels awesome to get four satellites and arrange em to shoot in whatever direction you want. Line em all up for a powerful, concetrated beam, spread em out for a shotgun-like effect for clearing crowds, or just make em shoot in all different directions for the hell of it. @Lan sounds really awesome I'll have to get it when I get the Wii U, plus its a good price for such an awesome game, hopefully Nano Assault EX is a good price too. The revw and Shinen's post has convinced me to purchase this one. Haha. Is it out at launch in the EU? This game is my first eShop download. It's loads of fun with a friend on their own separate screen. I was torn on the decision to buy Nano Assault Neo or Mighty Switch Force since those are the first download games to be $9.99. I figured since the game had 2 player, it would be a better investment. I never played this, is it like a 3d version of life force, or a 3d version of R-Type? I'm still loving Trine 2 to pass my time. Loved the original, and this looks great too. Awesome review, Ron! Nice review and nice score! I guess this will be one of the titles I download when I have a Wii u! Great review Ron. I really enjoy Shin'en's games and I loved Nano Assault on the 3DS. They always seem to know how to get the most out of Nintendo's hardware. I plan on picking this one up very soon. Saw the MiiVerse posting as i was posting my 2 player high score....This game is a lot of fun. Just the right amount of difficulty and the drive to be the best score is addicting. If you want to try and beat my friend and I, look for VaderPrime and Chewy799 on the high scores! Also, great review. I love the game, and also wish there were a few more stages to play through. 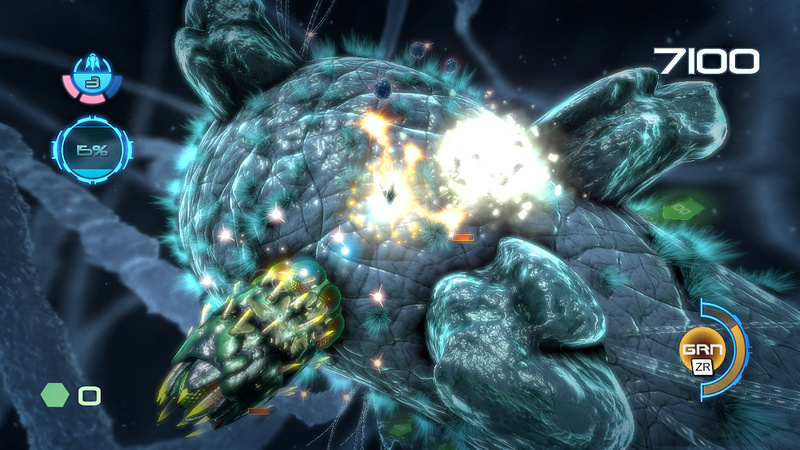 I absolutely love Nano Assault on 3DS and I've no doubt that it's absolutely gorgeous on Wii U. Looks like its another great Wii U launch title. I'm on this game very soon. Love the Nano series and can't WAIT to get my hands on this baby!!!! Great game; I'm not very good at it but it is an excellent title regardless of where in the launch cycle. Well worth the $9.99. Getting this as soon as December hits for the Deluxe Digital Promo, because I'll get $5 back from buying NSMB.U online, which is just enough to pay for the rest of this game. Never played the original but I might get this sometime from the eShop. Looks pretty good. This game looks great! I plan on getting both this and Nano assault EX at some point but I might get Nanostray and its sequel first. [email protected] You DO NOT have to wait until December to EARN points, although you have to wait until then to USE them. T_T Do I make myself clear? I love this game! Simple, addictive, beautiful, intense... just unpack the adjectives for this title. Anyone worried about NOT getting their money's worth can rest easy. I don't think I have ever purchased a better $10 game. @PinkSpider And ONM gave this 58%, which confuses me, but I still think I'm going to get it. Should I be looking to buy this, cuz it looks cool! So let me guess, it's like an arcade shooter type deal? I maybe look forward to getting this with some birthday money. I may have a reasonable story for this. A mysterious infection has spread everywhere on Earth. These diseases seem to be after "conquest" on Earth. A scientist finds out about this a creates and microscopic device that he either shrinks with or he controls it manually from his lab. Just a wild guess or suggestion. I'm going to try out the new revamped original for 3DS eshop and then I'll pick this up. I strayed from these games before, only because I thought the whole microscopic thing was weird, but that doesn't bother me now. Looks like a great series! My tagline review on the game: "Thinking small." Now, a longer one. There doesn't appear to be all that much content, the bosses are - with the exception of the third cell cluster (Omicron) - walkovers, and the same applies to most cells as well, the biggest exception being Omicron 1, or that was the way I felt it. I can't see how the game tried to push the envelope either. I haven't played Stardust HD on my friends' PS3s all that much, but I'd rather have it than NAN. Thankfully, I have Geometry Wars Galaxies for Wii to play. stick with the 3DS version, surprisingly it is the far better of the two. they are different games, the wii u game is not a direct port or anything, though there are some similarities in the levels of the wiiu version to the original 3DS levels. the 3DS version has far more content, isn't as frustrating and unforgiving, and isn't so rushed. the experience on 3DS feels far more rewarding overall. the wii u version does look great and is still fun but is very brief (thankfully it's also pretty cheap). at any rate though, there is extremely little to buy still at this point on the wii u eShop, so this isn't a bad choice at all in that respect. Id give it a 5/10. Great looking and sounding game but fundamental flaws when it come to the genre and the worst thing about all of these draw backs is that they could have been so easily fixed. I hope they release a a 1.1 ver dlc. Very good arcade style smup. The presentation is nice enough to make the experience extra satisfying on top of the already satisfying action. On large plus for this game is the gamepad integration that lets you customize the location AND angle of your satellite cannons to a high degree of precision and flexibility. This is a clever interface technique that rewards your urges for creativity and desire to absolutely max out your weapons' effectiveness.